Windows 95 was "awesome" and Windows 98 was slated to be "awesomer"? Linux was taking its baby steps and Mac OS was "pretty" and ruled the DTP circuit?? I was a young 'un, getting my feet wet in the magical world of computers. A Pentium 200Mhz with 32MB of RAM was my gateway in to the realm. (Yes.. it had a turbo button). Now, I do realise that there were even more magical times when people hacked away on mainframes and owning a Zinclair or Apple ][e was considered to be the coolest thing ever. I am too young to have lived in that era. So all of you grey beards, shut up and I promise to get off your lawn in a jiffy. Anyway, the reason I am going off on a nostalgic tangent is because I remember being really excited when BeOS was announced somewhere in the mid 90's. It was a multimedia OS from the ground up; something alien to us Windows drones who had to contend with belts-and-braces multimedia extensions that never worked as advertised. BeOS had support for multi-threading and pre-emptive scheduling at its core - making processor heavy multimedia apps work faster and better. It had a new file system that supported larger files than FAT32 and most importantly, it had a cool new interface! I was watching with an open mouth as an engineer demoed playing 4 videos at the same time in a single box running BeOS. My computer couldn't even play a single video without losing frames or freezing up. In that time period where hardware was getting faster and cheaper, an OS that could really utilise those features was a wonderful thing indeed. Unforutnately, after the initial hype, BeOS faded into the background and was never heard of again. (The conspiracy theorist in me thinks that a certain turtleneck clad individual had something to do with it. BeOS almost managed to become the new Apple OS before they did an about turn and bought NEXT instead). Things moved on and now multimedia is not such a big deal any more. Even my phone has more multimedia capabilities than my first computer now. 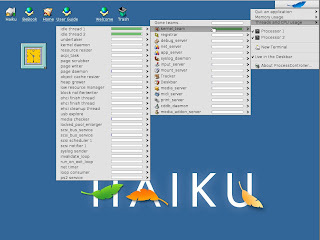 Relevance aside, I was pleasantly surprised to learn that BeOS still survives in the form of the Haiku project - a project run by enthusiasts to develop and maintain BeOS. (Hands up if you stumbled on it after reading xkcd). The current version is alpha 2 and the first thing that stuck me after first booting it up is its 90's style interface. (That's not a bad thing). The 16bit icons and pointers really made me feel nostalgic. 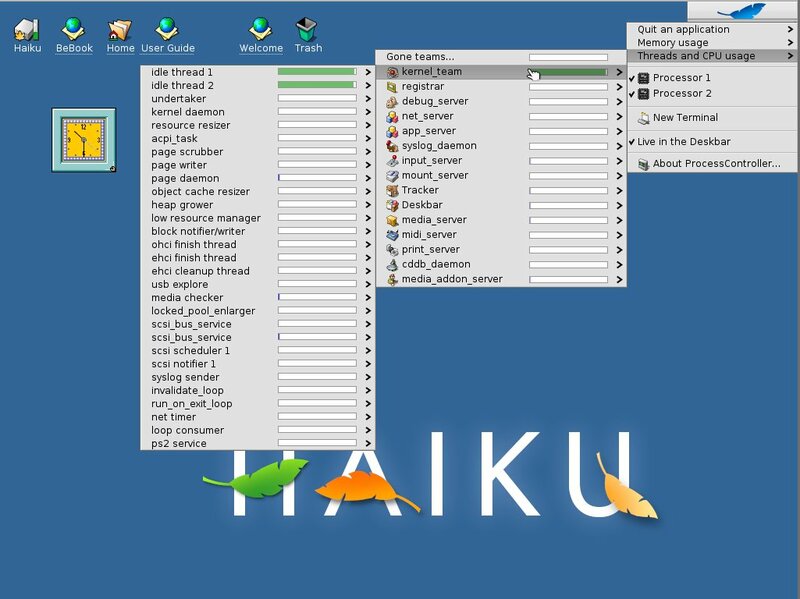 However, regardless of the retro look, Haiku seems to be a fairly modern operating system. I was particularly impressed with the task manager - which showed a cascading menu of processes and child-processes with their memory usage embedded in the menu. That is something I would like to have in my regular desktop as well. I don't think I am qualified enough to formally review Haiku. It is still in the alpha stage, so there aren't that many applications or features to talk about either. But, it looks to be a good enough operating system for basic day-to-day tasks. Given enough contributors, who knows? It might even become a mainstream OS someday. If you grew up in the 90's, I definitely recommend booting up Haiku and letting the nostalgia sweep over you.